One of my other posts was dedicated to the relationship between Kita and our cat, Zoey. 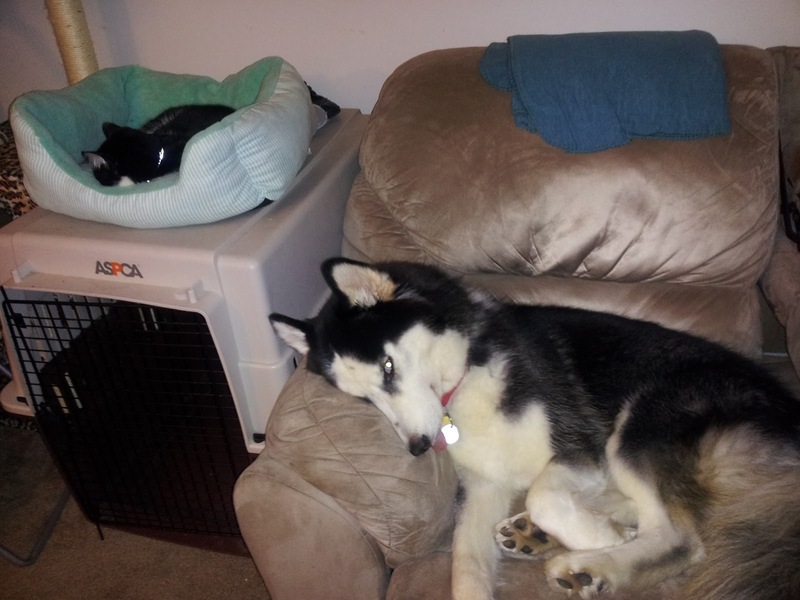 Zoey despises Kita, but luckily, our tuxedo cat, Seph, is more tolerant. For the record, I understand why our cats aren't particularly fond of Kita...he is about 6 times their size and never watches where he is walking or running. When we brought Kita home as a puppy, Seph was only a little smaller than him and he quickly let Kita know who the boss was....him, obviously not us humans! Since he was just a puppy, Kita has tried very hard to get Seph to play with him by placing or throwing his toys near the cat. Seph is never amused, and then Kita gets scared to get his toy back because he is a bit afraid of the cat's reaction. Kita is in love with both of our cats and is waiting until the day they will be willing to cuddle with him. He thinks he is very stealth about this. He's learned that if Seph is on the ground, Kita can lay down a good distance away, and then inch closer to Seph whenever his eyes close. This tactic doesn't really work out, as Seph knows what is going on at all times, and when Kita is just about to touch him with his nose or paw, Seph gets up and moves. Likewise, if Zoey ventures out into our living room, Kita slowly moves closer to him but doesn't get nearly as close. If Kita bothers Seph these days, he is likely going to get smacked, but the thing is Kita usually can't even feel it with his thick fur and just continues whatever he happens to be doing. If Seph is particularly annoyed with Kita, he'll aim for his nose without using his claws as a warning. Then Kita throws a little temper tantrum where he sways back and forth and sits down with a sigh. Life as a dog in a home with only cats is rough. My advice for cat owners that want to get a large dog but are nervous to try would be to get a young puppy. Kita was young enough to be trained to defer to the cats at all times, because we knew he could very easily hurt them if he wanted to, and some Huskies have hurt cats in the past. Kita is very gentle and loving to all of us, including our tortoise, so we can trust him, but we did take time to make sure that he was not aggressive through training and monitoring. If you want to adopt a dog (or a cat), visit Petfinder and look at the many shelter pets that need homes near you. I'm also happy to answer any questions if you have them!